For millennium, designers of our built and natural environments have positioned the viewer in nature, setting benches in just the right spots with gorgeous vistas, or even creating pavilions or pagodas that offer both a respite from the world and a vantage point for engaging with it. 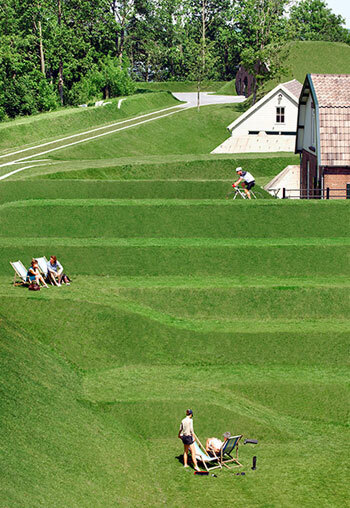 Contemporary landscape architects and architects are creating singular platforms for experiencing nature. In these examples, the biophilic platforms are as appealing as the surrounding nature. 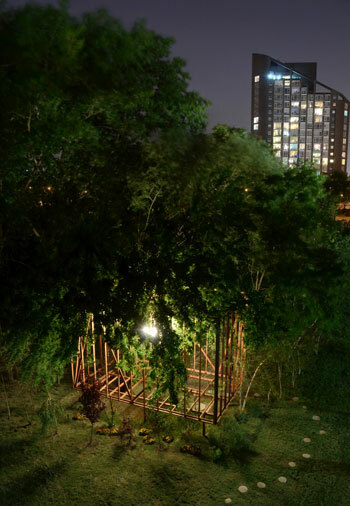 Japanese architect Tochihiro Oki created Tree Wood for last year’s “folly” competition in Socrates Sculpture Park in Astoria, New York. 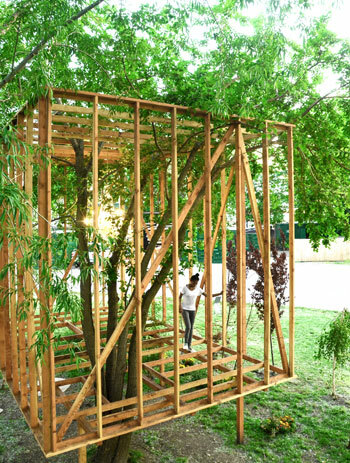 With this project, a simple wood frame set amid the forest looks over a grove awaiting the visitors’ discovery. Inside, the visitor is enveloped by the trees but also the skeletal frame made of 2 x4 planks held together with studs and nails. 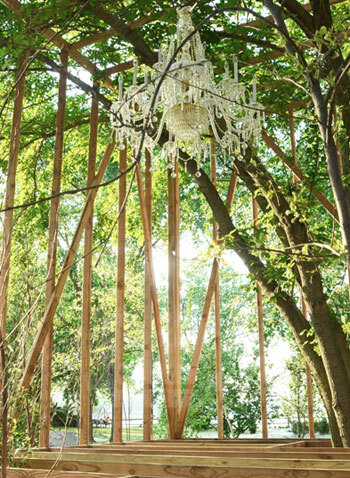 A chandelier sits at the top of the structure, creating the sense that one is in a room. 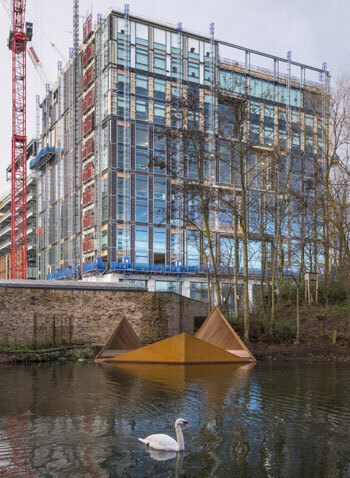 Another example, Viewpoint, created by the Finnish Institute in London and the Architecture Foundation, is a floating platform on Regent’s Canal in Camley Street Natural Park, London. 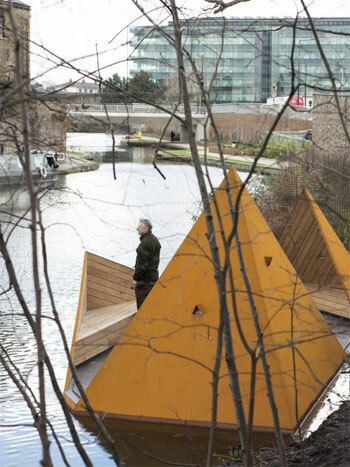 Designed by Finnish design firm AOR, the floating pavilion provides a way to bring visitors up close to London’s central nature reserve and the rich urban wildlife found there. ArchDaily writes: “The inspiration for Viewpoint comes from the rocky islets and islands of the Nordic. For Finns, these islands are places of sanctuary, to relax the mind and get away from hectic city life.”But the platform’s actual form was also inspired by the simple, temporary structure created by fishermen and farmers. In Finland, these triangular structures are created out of tree branches, moss, and leaves. Viewpoint seems to be a natural draw for those walking through the park. Visitors are likely to see Daubenton’s bats, whooper swans and the elusive Kingfisher. 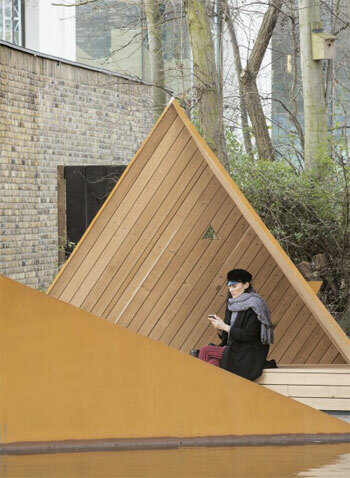 The structure will be used by the London Wildlife Trust for educational programs for kids. Special triangular openings are set at different heights, giving kids of all ages a special view into the canal and the wildlife that it attracts. 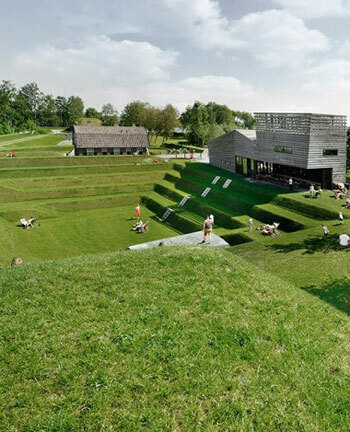 Lastly, Fort Werk aan ‘t Spoel, an old fort in the Netherlands has been redesigned into a new kind of viewing platform for nature, except this one takes the visitor deeper into the ground for a new perspective. The fort is a national monument dating to 1794 and was part of the military defense line that enabled “intentional flooding,” to protect one of the inundation locks, writes RAAAF and Atelier de Lyon in Landezine. 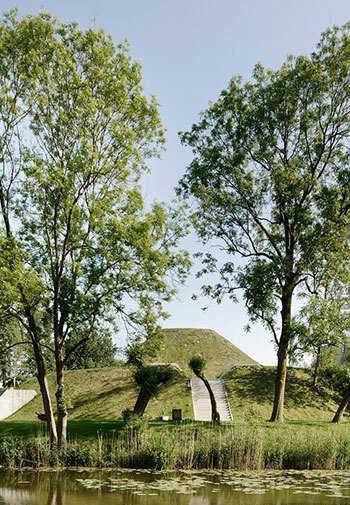 Sculptured grassy steps lead the visitor down into the lock, which is surrounded by trees. It has become a major attraction in the “New Dutch Waterline,” says the design firms. The new design, commissioned by the city of Culemborg and the Foundation Werk aan ‘t Spoel, is inspired by the old infrastructure but forges something new from it.